With Christmas just around the corner, everyone is ready and geared up for the festivities to get underway. Mince pies, champagne, selection boxes and umpteen bags of sweets will no doubt make their way into our festive diets. It's a thoroughly enjoyable time of year, but spare a thought for your teeth. Constant snacking, drinking and eating of sugary foods and drinks over Christmas can make the holiday period a miserable time for teeth. The indulgences and tempting treats on Christmas Day and Boxing Day in particular means that teeth are going to be in harm's way for over the 48 hours over the festive period. Some traditional Christmas foods like Cranberries, the perfect accompaniment for your Turkey, are scientifically proven to be beneficial to overall health, and scientists have also shown they may have the capacity to help prevent both gum disease and tooth decay. However, moderation is important as cranberries are acidic and it is a good idea not to have them too often. That means it is important to be extra vigilant with your oral health over the Christmas period. Remember, teeth are under attack for up to one hour after eating or drinking, and if you think about how much is consumed, and how often, particularly over Christmas and Boxing Day, your teeth don't really get the chance to recover. So please forgive this Grinch, but to make sure your teeth don't suffer the festive blues, here are five ways to look after them this Christmas and New Year. 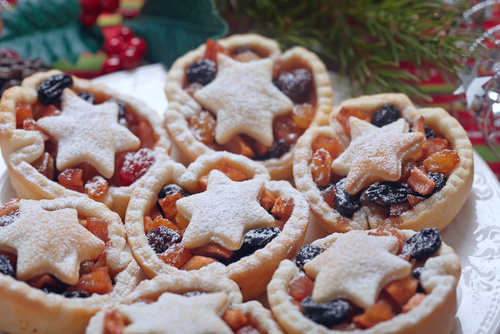 Mince pies, Christmas cake and Christmas pudding may satisfy millions of people after a traditional Christmas dinner, but one thing they do not satisfy is your teeth. They are all laden with dried fruit, which is high in sugar. These kinds of foods stick to teeth and can cause the most damage, particularly if we're gorging on them throughout Christmas Day and Boxing Day. The worst thing you can do is wrap up your oral hygiene routine on Christmas Eve for a few days. Teeth take a bit of a hammering, what with all of the chocolates, sugary foods and drinks and the alcohol consumed over the festive period. Christmas morning might be an exciting time for children, but if you're a parent make them wait a little longer - it's only two minutes after all! If a post-Christmas snooze on the sofa is more your thing, then do remember to brush your teeth before you head to bed. Cheese is great for teeth. It helps to return the mouth to its natural acid balance and help reduce the chances of developing tooth decay. That's why cheeseboards after the main meal are a great idea. Even a little piece of cheese can have the same effect. The same can be said for sugar-free chewing gum (although it may not be great table etiquette!). We can all confess to attempting to open a bottle of beer with our teeth at some point in our lives. Although you can't legislate for genuine accidents, please remember your teeth aren't tools. If your party trick is to open a bottle of beer with your teeth, or if you're always biting open the crisp packet, you're actually doing your teeth more harm than good. The best chance of having your tooth successfully put back in is to keep the tooth in the cheek. If this isn't possible, keep it in some milk until you receive the necessary emergency dental work. The sooner you can do this the better. Moderation is definitely the most important thing to remember. In order to ensure you fully enjoy this time of year without having to compromise on what you eat and drink, bear in mind it is not how much sugary food and drink you have, it is how often you have them that causes a perilous situation for oral health. It's OK to say no to that extra sweet as the tin comes round, or have a glass of milk instead of one last glass of fizz.